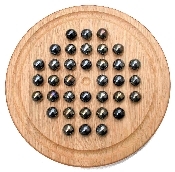 Same game as our standard Round Solitaire game but with larger marbles (7/8") and 4 extra spots for marbles. This challenging solitaire game (also knows as Duke of York) will keep even the smartest of game players busy for hours. Remove each marble as you jump them and try to leave only 1 marble left on the board. The second game called Fox and Geese (for 2 players) can also be played on this game board. The game comes with 37 marbles and playing instructions for both games. For ages: 7 and up.